A 20-year-old woodsworker was fatally injured while limbing a softwood tree with a chainsaw. His saw blade kicked back and the rotating chain struck him in the groin area, severing the femoral artery. The cut was just above the protective padding of his chainsaw pants. The young man died before reaching the hospital. A 26-year-old woodcutter died as a result of injuries sustained while using a chainsaw to limb a tree. The victim was pulling the saw towards himself when the chainsaw kicked back, striking him in the upper thigh above the protective padding. A 61-year-old woodsworker died while cutting two 4’’ diameter fir trees. He was resting on one knee using the pushing part of the bar when kickback occurred, striking him in the upper thigh just above the protective padding. These incidents and more happened in New Brunswick forests in the last decade. In all three incidents, improper use of a chainsaw caused kickback to the unprotected upper thigh and groin area, resulting in fatal injuries. A chainsaw is possibly the most dangerous tool used in the woods. But these tools can be operated safely. With proper maintenance, personal protective equipment, and correct technique, these tragedies can be prevented. Know how to protect yourself. By law, your employer must inform you of any hazards associated with handling chainsaws or any other tool or equipment you use on the job. Be aware of the pushing and pulling parts of the chainsaw bar. Be aware of the kickback zone of the chainsaw bar and never allow this area to touch the wood or any other surface. Position yourself at all times so that in the event of a kickback the saw will not be directed at you, but to your side or away from you. Never use the chainsaw with a motion towards yourself while limbing or bucking. 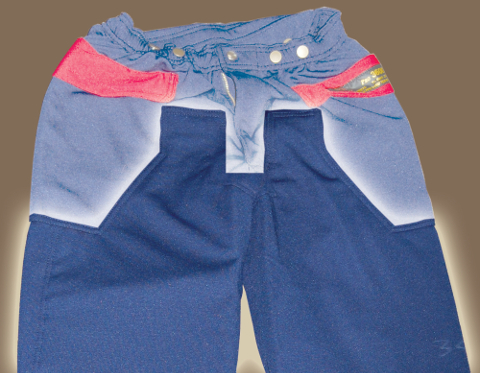 Wear chainsaw pants that offer protection to the belt line rather than stopping at the upper thigh. While PPE is your last line of defense in preventing accidents, it could save your life. 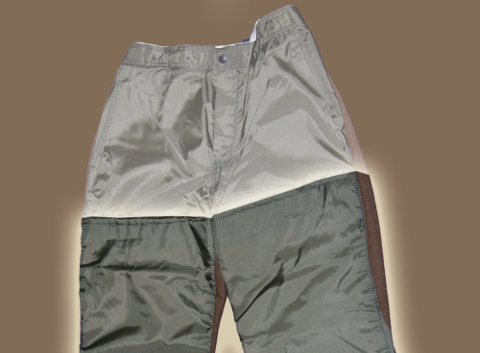 These pants offer increased protection. Highlighted area shows protective padding. These pants offer limited protection.